Kieran Quinn, Commodore of Nyack Boat Club (NBC) in Nyack, NY, says there are fluffy clouds that can only be seen in Nyack. He should know. 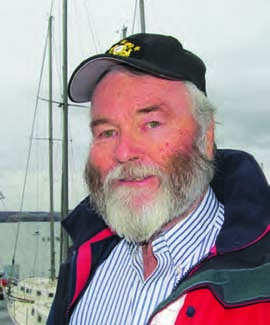 Kieran’s served as Rear Commodore (Programs) 2008-2009, Vice Commodore 2010-2011 and Commodore since 2012. In terms of depth of skills taught to juniors, Kieran says, “We start them out in Optis and we go up through the 420s, and we even sent a team to Nantucket Race Week this year. The kids go from the basics to being competent one-design sailors. We work on them to develop cruising skills and to develop skills to handle large keelboats.” Two well-known alumni of the NBC Junior Sailing program are Kerry Klingler of Quantum Sails, and Justin Coplan, First Runner-Up in the 2013 Lightning World Championship. When asked if NBC’s do-it-yourself philosophy helped it recover from Superstorm Sandy, Kieran replied, “No question about it.” Like many clubs, there was extensive damage to all the facilities: the clubhouse, bulkheads, hoists, docks, piers, etc. “The recovery for the club cost us almost $400,000, but that doesn’t count the hours, the days, the members put in on the immediate recovery of the club,” he explains. “Following the storm we had people pouring into the club to help with cleanup. People didn’t have lights on at their homes for weeks, and they were coming to the club and working when they were still without power. They couldn’t go into their own jobs, there was a gas crisis and yet people were still coming to the club. It was utterly amazing. According to Kieran, while sailing north through the Tappan Zee in 1609, Henry Hudson looked to his left and said, “Boy, that would be a good place to put a boat club.” Hudson’s vision is now our reward.